May 14, 2012, 10:03 a.m.
An MIT grad student is studying users’ behavior to understand how his software might influence their critical thinking skills. By Andrew Phelps May 14, 2012, 10:03 a.m.
Last November I wrote about Dan Schultz and his Truth Goggles, a piece of software he’s developing in partnership with PolitiFact that highlights suspicious claims in news articles. It’s as simple as spellcheck. Now, as Schultz finalizes his graduate thesis at the MIT Media Lab, he’s conducting a user study to understand how people (anonymously) respond to a prototype of the tool. It’s our first look at the software in action, and he wants you to give it a try. Here’s how it works. First you’re asked to evaluate the veracity of several statements. “Over 40 percent of children born in America are born out of wedlock.” “Some billionaires have a tax rate as low as 1 percent.” No Googling; you have 20 seconds for each claim. Next you’re asked to read actual news articles that contain claims in PolitiFact’s database. 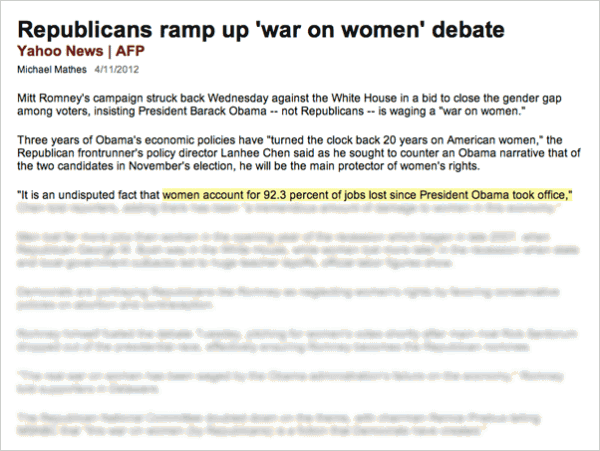 In “highlight mode,” the claim in question is unobtrusively highlighted; click the text for PolitiFact’s evaluation. In “goggles mode,” all of the text that follows the first highlighted claim is blurred out, making it impossible to read on without engaging the claim first. In “safe mode,” all highlighted phrases are blocked out, forcing the user to reveal each one by one. Finally, you’re shown many of the same claims again — this time without the goggles — and asked to rate their trueness. Schultz wants to see whether his software influences the way people process information and make conclusions. “All of the current interface prototypes are walking different lines between theoretical effectiveness and convenience. I’m just as curious as you to see if the interfaces end up creating different degrees of impact in the study environment,” Schultz told me in an email. I found that the latter two settings, goggles mode and safe mode, focused my attention on phrases I might otherwise have brushed past. Sure, my internal skepticism detector usually starts beeping whenever I see quotation marks, but this exercise also forced me to consider claims in a reporter’s copy — e.g., “About 2.5 million young adults from age 19 to 25 attained health coverage as a result of the Affordable Care Act…” — the kind of information I’m more likely to assume is true. After using the goggles for awhile, it was impossible to read articles without a skepticism bordering on incredulity. If you don’t want to wade through the study, there’s also a static demo page available. Schultz said the study and the demo are both “canned,” in that he preselected articles he knew to contain claims checked by PolitiFact. “Other than that, it’s using a live working version of Truth Goggles,” he said. Schultz doesn’t want to talk much yet about the study design, lest he taint the data. “I’ll just say that the results so far appear incredibly interesting,” he said. His thesis, and a working version of the software, should be finished by as early as next week. POSTED May 14, 2012, 10:03 a.m.
Phelps, Andrew. "How to peek through Dan Schultz’s Truth Goggles, the B.S. detection software, right now." Nieman Journalism Lab. Nieman Foundation for Journalism at Harvard, 14 May. 2012. Web. 23 Apr. 2019. Phelps, Andrew. "How to peek through Dan Schultz’s Truth Goggles, the B.S. detection software, right now." Nieman Journalism Lab. Last modified May 14, 2012. Accessed April 23, 2019. https://www.niemanlab.org/2012/05/how-to-peek-through-dan-schultzs-truth-goggles-the-b-s-detection-software-right-now/.